Pan de Cadiz ~ I Can Do That! 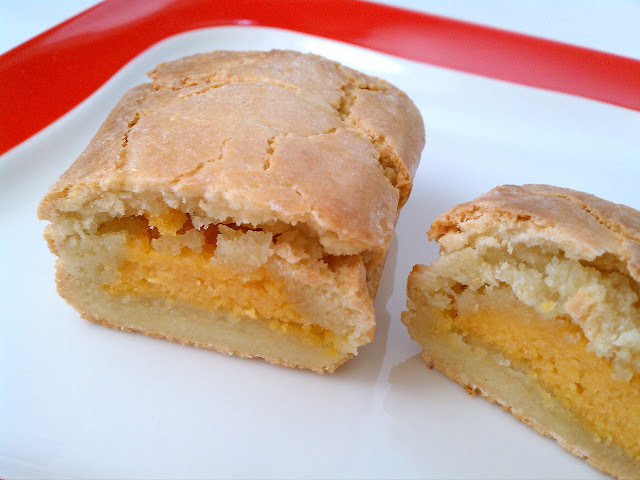 Early this year, while browsing La Tienda's catalogue, a small dessert loaf called Pan de Cadiz caught my eye. It's marzipan baked with a filling of candied sweet potato, normally sold and eaten during the Christmas season. Of course, I had to find a recipe for it, found one online written in Spanish, and this one in English. My cake came out a little bit dry and crumbly on top because I overbaked it but I love its moist interior specially the candied sweet potato portion, and my husband says it tastes exactly like the ones he had years ago back in the Philippines. I'll bake another batch and will closely watch it to avoid drying out the top portion. I will also make at a later date just to compare the Philippine version, masapan or mazapan, which are baked in tiny paper or muffin cups. In a food processor, process almond flour to a fine powder, add the sugar and egg white and process for 2 minutes. Remove and divide the almond paste into 3 pieces. Return a third into the food processor together with the candied sweet potato and egg yolk. Pulse to mix. Flatten the remaining 2 parts into rectangles. Place the candied potato portion on top of one rectangle. Place the other flattened paste on top of the yam. Smooth and shape into a loaf. Place on a small cookie sheet lined with parchment paper. In a small sauce pan, combine syrup ingredients, let boil until sugar dissolves. Turn heat off. With a pastry brush, paint the loaf all over with syrup. Bake for 10 minutes. Turn on broiler and broil loaf until top is golden brown.